WARDJet is excited about developing a new large scale G-Series waterjet, slated for installation early next year. Solid models have been drawn and plans are underway for the customer’s location to be modified to accommodate this giant-sized waterjet and soon fabrication of components will begin. In the meantime, the WARDJet mechanical engineering staff have created a three dimensional model of the G-4816 to illustrate what the final waterjet will look like. 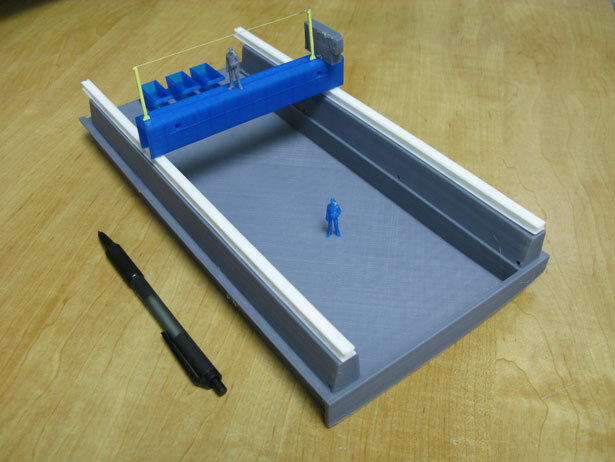 This model was generated on a 3D printer used to make small scale models of waterjet components. In the photo you’ll see the G-4816 general design. The high rail gantry will feature a safety line for operators to use when performing maintenance, and three AROS hoppers to remove abrasive from the massive waterjet tank. The scale is approximately 1/64th of actual size, as illustrated by the pen placed next to the model. The final G-4816 waterjet will be an astonishing 48 feet by 16 feet! Read more about these giant sized waterjets by visiting the G-Series webpage.